1) Craig and Kimmie Giesecke have returned to a prime location on St. Charles Ave - the Blind Pelican. We stopped in there on Wednesday for my beloved (and much missed) chicken fried steak with garlic mashed potatoes, smothered green beans, and sausage gravy. (Note: skip this meal the week before going to the doctor to monitor my blood pressure.) Tom was reunited with his also much loved Best Fish Sammich Ever, which, as always, lives up to the name. I don't know if they are still using the J'Anita's name (the sign outside the door on Wednesday night said "Jamitas") but I am so, so, so happy they are back, And apparently busy as hell. So when you go, be prepared for some weak table service - I don't think the front of house crew anticipated the kitchen being so popular so fast - but awesome food. And I think they are working out the issues and instituting new systems, etc. They've actually only been open a little over a week, so it's still all finding its rhythm. Food's already in the groove though. 2) McClure's BBQ hit the weekend circuit this past Friday night! After a lovely session at the Avenue Pub, we biked down to the Rusty Nail to have some post-beer BBQ. And it was gooooooood. The ribs were divine. (Brisket and pulled pork were nothing to sneeze at either.) We had a beer (Ruthless Rye on tap!) and chowed down happily out in the courtyard on a beautiful April night, then biked home. Good work Neal! (I totally drunk texted him how awesome his food was instead of drunkenly gushing to his face when he was obviously super busy.) That made for an awesome Friday night. 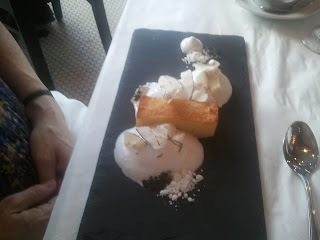 3) Went to Coquette for dinner on Saturday night. Sadly, they were unable to squeeze in a fifth person in to our reservation, so I had to leave Tom at home. The food was very good as always- I had the pickled beet salad (mmm.... burrata) and then their version of fried chicken (I so wish places used the leg instead of the breast, though.) The chicken was pretty good, considering it was white meat - restaurants often have a hard time getting the doneness right on chicken breast. (general rant that does NOT apply to this meal at Coquette: It's awful when it's overcooked, and I've had a few instances where places pull the breast to early to avoid that fate, which is... really gross. This is why I do not eat chicken in restaurants, generally speaking.) BUT! this one was fine. The general blandness of this cut of meat was helped quite a bit by the zing of the accompanying ramp pesto, and the baby turnips were fresh and earthy and the dish was very spring-y. We also had a side of Brussels sprouts that were outstanding. But the part of the meal I definitely wanted to comment on and share with the internet was the fact that Coquette has cleared out the back office area of its building and created a kitchen just for desserts. They've really elevated their dessert game, and the four our table ordered were amazing. 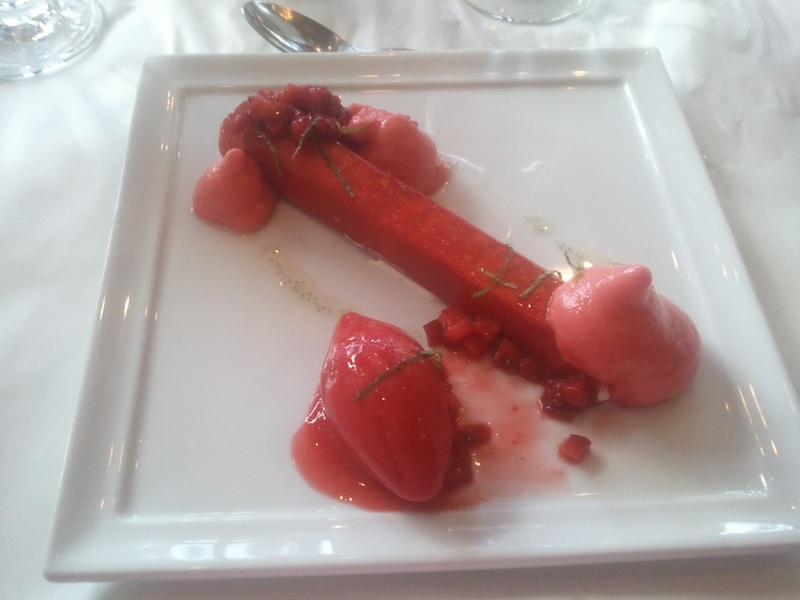 This was my dessert, called "Strawberries and Cream." Since it's the height of strawberry season, I couldn't resist. Strawberry sorbet, strawberry salad with basil and a hint of balsamic, strawberry creme fraiche, and some sort of dehydrated strawberry covered cream log. Milk chocolate mousse with peanut butter sorbet. 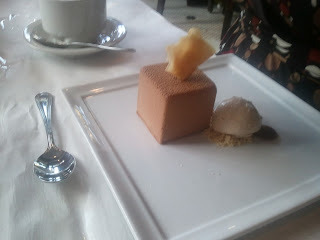 There was also peanut butter inside the mousse cube! 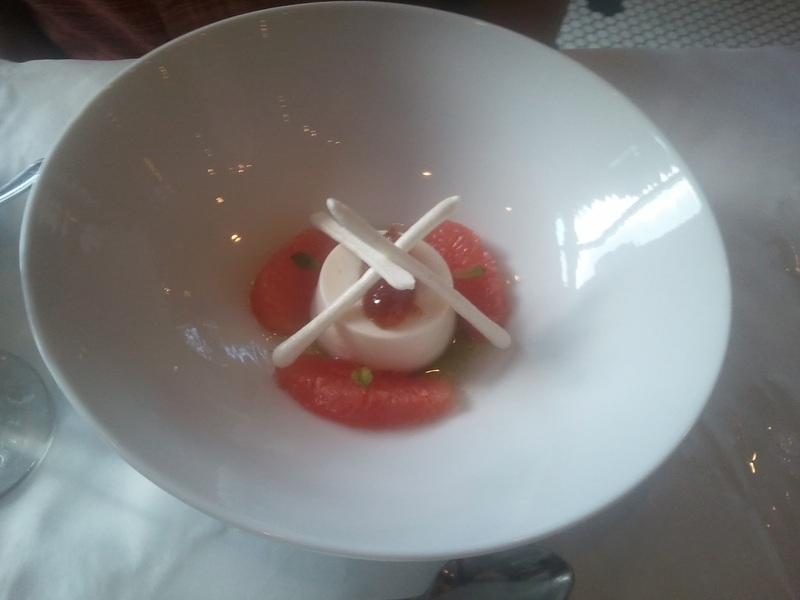 This was called "Coconut, coconut, coconut." This dessert was transcendent- the kaffir lime panna cotta with grapefruit, meringue, some sort of citrus preserve. Also, the French Quarter Fest is this weekend but somehow we haven't gotten over there. Ah, well. We did enjoy the OCH market (with delicious Tsai food- especially the shittake beignets) and supported some local artists. Did some much needed stuff around the apartment (it's getting nice and cozy and lived in!) Slept a bunch. I have begun to take it easy on myself about not getting to every awesome thing that's going on in New Orleans, letting go of the guilt of Not Doing New Orleans Right. There's amazing stuff always going on- big stuff like FQF, but also small stuff like a second line wandering through a residential street, a great restaurant, strolling around people-watching and smelling the blooming jasmine and magnolia. April is just so gorgeous here and merely living day to day is a beautiful state of being. I hope everyone had a wonderful weekend, no matter where it took you or how it ended up.